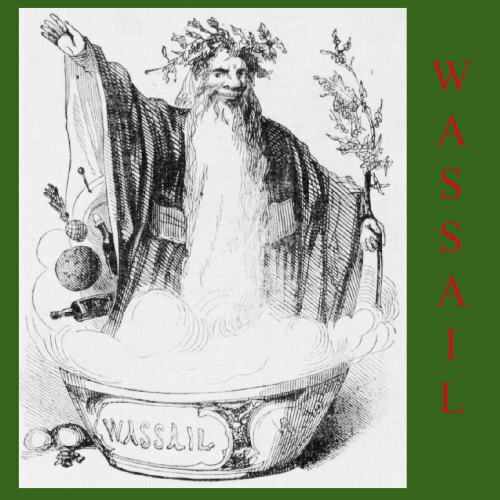 Wassail is a traditional Christmas thru Twelfth Night toast meaning “to your health” ( Anglo Saxon waes hael ) and a spicy, alcoholic beverage served to guests throughout the season. Recipes abound on the internet but typical ingredients include apples, brown sugar, lemons and oranges, cloves port and sherry, cinnamon, ginger and nutmeg. In case you’re in the mood for literary revelry here are several lovely, very old, traditional wassail toasts to share at your holiday dinner! Christmas, the joyous time of the year! With Laurel green, and sacred Mistletoe. Brawn, and a dish of sturgeon. With the wassailing bowl, we’ll drink to thee!